One of the best things about teaching yoga is the privilege of meeting the myriad of interesting people who come to classes. I had no idea Jean Harrod was an author, playwright and former diplomat until she announced her novel was soon to be published. We all ordered copies. Naturally. I am a "Girl with the Dragon Tattoo" fan and a BBC4 crime drama aficionado: Borgen; The Bridge; Montalbano; Spiral - you get the idea? This little gem is of the same genre; a meaty novel with an intricate plot, solid and likeable, yet intriguing characters, and awash with authenticity. Limited by available time I read it in two days instead of cover to cover! It's a genuine page turner. Thankfully there's more to come because it's the first novel in a trilogy. 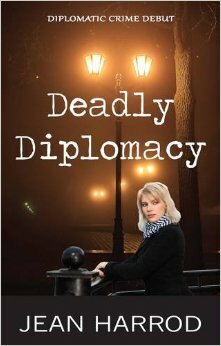 Holiday reading June 2015 - Deadly Deceit.